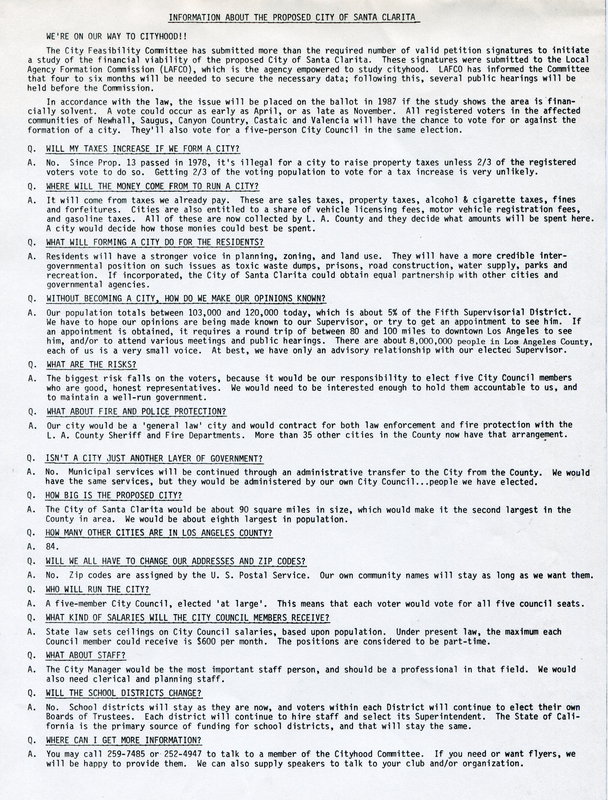 SCVHistory.com | History of Cityhood | Press Kit: City of Santa Clarita Feasibility Committee, 1985. Press Kit: City of Santa Clarita Feasibility Committee. Twice before in the past decade the residents of the Santa Clarita Valley voted to form their own County. The issue failed because the balance of the County did not support their action. Subsequently, legislation changed and no new county can be formed in this area within the foreseeable future. Many residents of Canyon Country, Castaic, Newhall, Saugus and Valencia remain interested in local government and, at their request, the Joint Chambers of Commerce have formed a committee to study incorporation. The most populous unincorporated area within Los Angeles County, the Santa Clarita Valley is experiencing tremendous growth which is straining the ability of the infrastructure to support it, and changing the life styles prized by many citizens. More than 100,000 persons reside in the area under consideration, another 100,000 will be added in 15 short years. 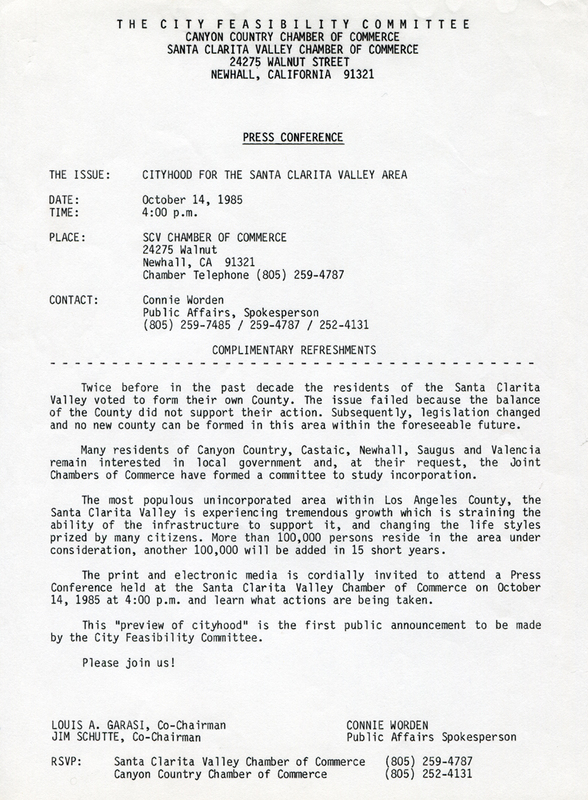 The print and electronic media is cordially invited to attend a Press Conference held at the Santa Clarita Valley Chamber of Commerce on October 14, 1985 at 4:00 p.m. and learn what actions are being taken. This "preview of cityhood" is the first public announcement to be made by the City Feasibility Committee. 1. The proposed City would consist of the communities of Canyon Country, Castaic, Newhall, Saugus, and Valencia. The area of Canyon Country east of Saugus along Soledad Canyon Road is often called Honby. This is a small area of the bend in the Santa Clarita [sic] River. A substantial mobilehome park and residential tract are among the facilities built between the River and Soledad Canyon Road. The heart of Canyon Country's population is north of the river and extends to the slopes and mesa nearby. This is a well developed residential community whose families shop at a major concentration of commercial land uses along both sides of Soledad Canyon Road. Mint Canyon, to the east, is narrow and is beginning to urbanize. The former route of State Highway 6 (now 14 — Sierra Highway) passes through this canyon, and commercial uses remain from busier days with a resident population living in smaller custom homes. There are a number of new homes near the Canyon mouth; new apartments and restaurants evidence revived interest in this oldest section of Canyon Country. The mobilehome parks near Solemint Junction provide less expensive housing opportunities. Geographically, Friendly Valley and Serena Park are part of Canyon Country. This area, west of the Antelope Valley Freeway and south of the River, houses both conventional tract developments and a retirement village. Along Sand Canyon, and northward up the tributary canyon, the developments are molded by the canyon's geography, and are somewhat secluded from commercial and public services. The area consists of large lot, custom home sites south of the Antelope Valley Freeway. The rural community of Castaic came into existence first as a highway stopover with small cafes and automobile services along the old Ridge Route after its opening in 1914. The Ridge Route made a Los Angeles to Bakersfield trip possible in just four days. The upper Castaic Valley area was a good stopping place prior to the climb up to Tejon Pass. Increasing traffic, induced by Southern California growth, made a new route necessary, and construction of Highway 99 promised more visitors. 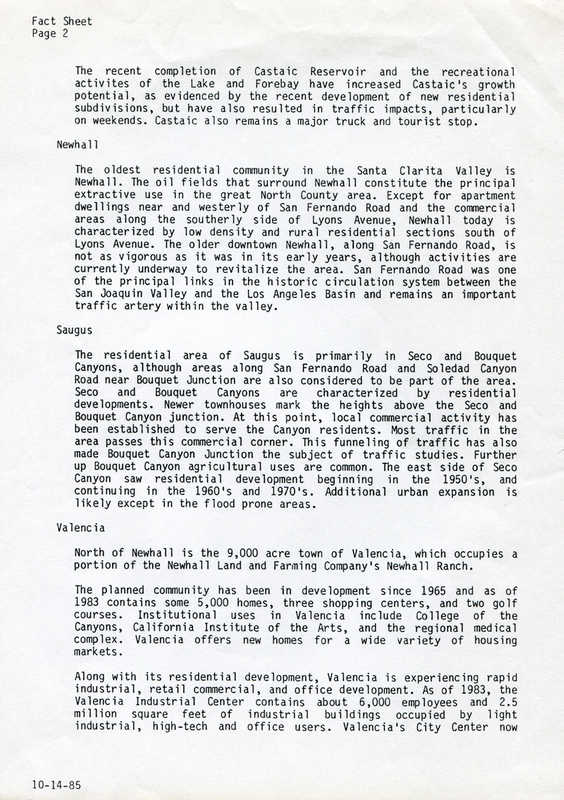 Stores, gas stations, and restaurants that were established along the original Ridge Route were relocated to serve the second valley route. The decades after World War II brought a resurgence of Southern California growth to the little community. The recent completion of Castaic Reservoir and the recreational activities of the Lake and Forebay have increased Castaic's growth potential, as evidenced by the recent development of new residential subdivisions, but have also resulted in traffic impacts, particularly on weekends. Castaic also remains a major truck and tourist stop. The oldest residential community in the Santa Clarita Valley is Newhall. The oil fields that surround Newhall constitute the principal extractive use in the great North County area. Except for apartment dwellings near and westerly of San Fernando Road and the commercial areas along the southerly side of Lyons Avenue, Newhall today is characterized by low density and rural residential sections south of Lyons Avenue. The older downtown Newhall, along San Fernando Road, is not as vigorous as it was in its early years, although activities are currently underway to revitalize the area. San Fernando Road was one of the principal links in this historic circulation system between the San Joaquin Valley and the Los Angeles Basin and remains an important traffic artery within the valley. The residential area of Saugus is primarily in Seco and Bouquet canyons, although areas along San Fernando Road and Soledad Canyon Road near Bouquet Junction are also considered to be part of the area. Seco and Bouquet Canyons are characterized by residential developments. Newer townhouses mark the heights above the Seco and Bouquet Canyon junction. At this point, local commercial activity has been established to serve the Canyon residents. Most traffic in the area passes this commercial corner. This funneling of traffic has also made Bouquet Canyon Junction the subject of traffic studies. Further up Bouquet Canyon agricultural uses are common. 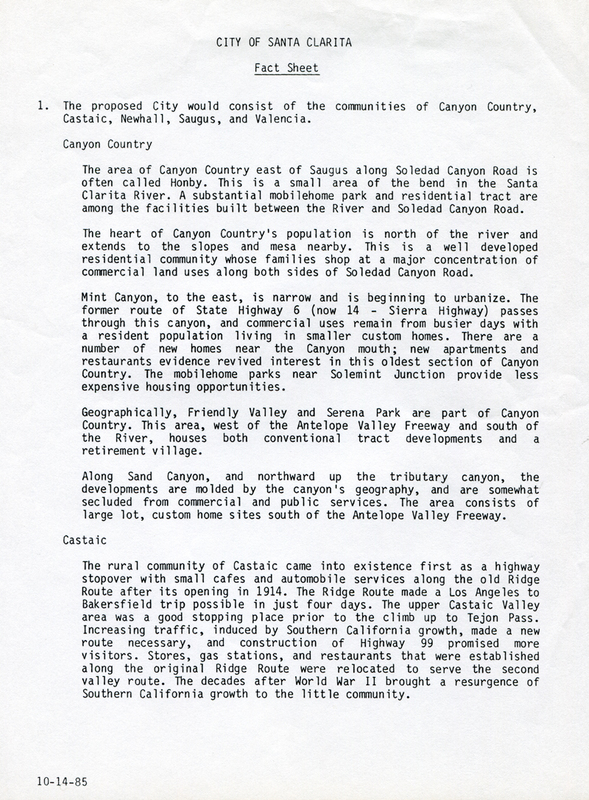 The east side of Seco Canyon saw residential development beginning in the 1950s, and continuing in the 1960s and 1970s. Additional urban expansion is likely except in the flood prone areas. North of Newhall is the 9,000 acre town of Valencia, which occupies a portion of the Newhall Land and Farming Company's Newhall Ranch. The planned community has been in development since 1965 and as of 1983 contains some 5,000 homes, three shopping centers, and two golf courses. Institutional uses in Valencia include College of the Canyons, California Institute of the Arts, and the regional medical complex. Valencia offers new homes for a wide variety of housing markets. Along with its residential development, Valencia is experiencing rapid industrial, retail commercial, and office development. As of 1983, the Valencia Industrial Center contains about 6,000 employees and 2.5 million square feet of industrial buildings occupied by light industrial, high-tech and office users. Valencia's City Center now contains the Santa Clarita Valley Civic Center complex and two large office buildings. A corporate office center was recently opened on a 50 acre site surrounded by Valencia Golf Course. 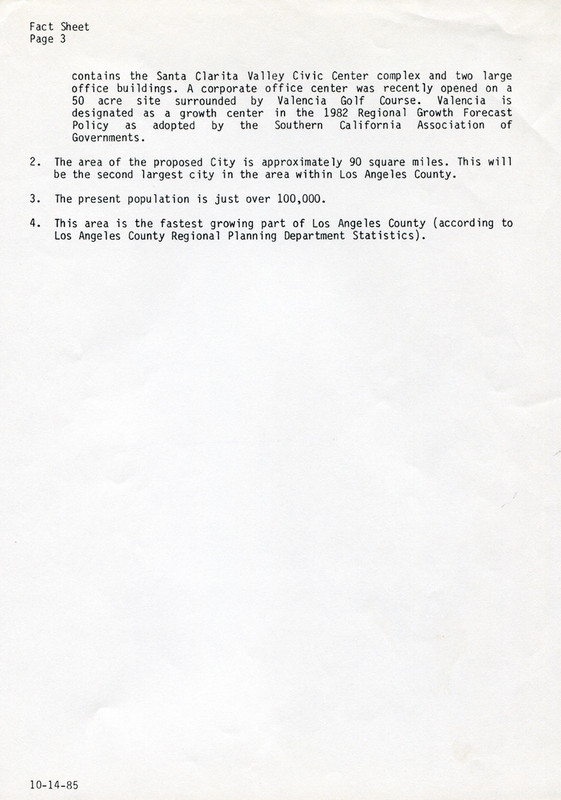 Valencia is designated as a growth center in the 1982 Regional Growth Forecast Policy as adopted by the Southern California Association of Governments. 2. The area of the proposed City is approximately 90 square miles. This will be the second largest city in the area within Los Angeles County. 3. The president population is just over 100,000. 4. This area is the fastest growing part of Los Angeles County (according to Los Angeles County Regional Planning Department Statistics). 1. To place upon the residents of this area the responsibility for self-government and the subsequent provision of a range of municipal services as defined and provided for by the Constitution of the State of California. 2. To have more local control. 3. To keep local taxes for local needs. 4. To gain more local representation. 5. To establish priorities that better meet local needs. 6. To give residents equal partnership with other cities and agencies. 7. To develop our own General Plan with local citizens. 8. To guarantee better land use planning and enforcement of zoning codes. 9. To make city officials more accessible. 10. To provide greater awareness of local issues. 11. To have greater citizen's participation in decisions. 12. To expedite local governments decisions to save taxpayers time and money. 13. To provide a government directly responsible to residents. 14. To maintain and improve the quality of life in Santa Clarita. WE'RE ON OUR WAY TO CITYHOOD! The City Feasibility Committee has submitted more than the required number of valid petition signatures to initiate a study of the financial viability of the proposed City of Santa Clarita. 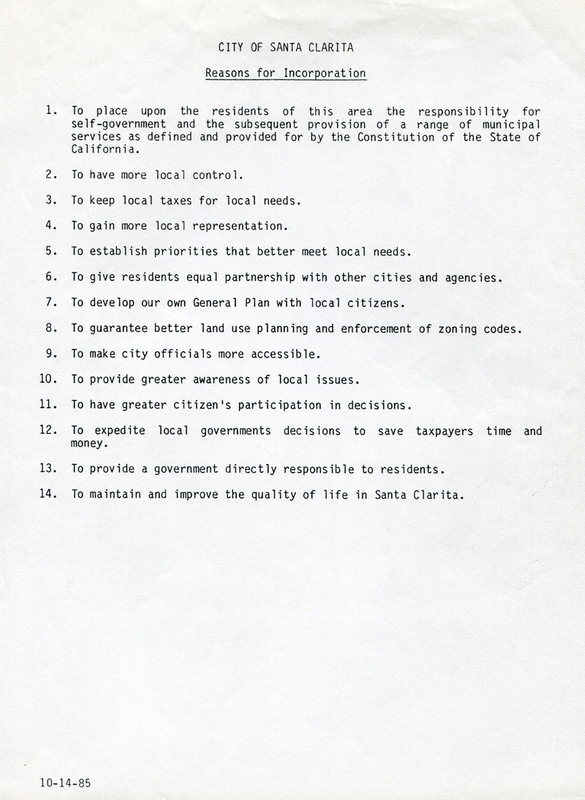 These signatures were submitted to the Local Agency Formation Commission (LAFCO), which is the agency empowered to study cityhood. LAFCO has informed the Committee that four to six months will be needed to secure the necessary data; following this, several public hearings will be held before the Commission. In accordance with the law, the issue will be placed on the ballot in 1987 if the study shows the area is financially solvent. A vote could occur as early as April, or as late as November. All registered voters in the affected communities of Newhall, Saugus, Canyon Country, Castaic and Valencia will have the same chance to vote for or against the formation of a city. They'll also vote for a five-person City Council in the same election. Q. WILL MY TAXES INCREASE IF WE FORM A CITY? A. No. Since Prop. 13 passed in 1978, it's illegal for a city to raise property taxes unless 2/3 of the registered voters vote to do so. Getting 2/3 of the voting population to vote for a tax increase is very unlikely. Q. WHERE WILL THE MONEY COME FROM TO RUN A CITY? A. It will come from taxes we already pay. These are sales taxes, property taxes, alcohol & cigarette taxes, fines and forfeitures. Cities are also entitled to a share of the vehicle licensing fees, motor vehicle registration fees, and gasoline taxes. All of these are now collected by L.A. County and they decide what amounts will be spent here. A city would decide how those monies could best be spent. Q. WHAT WILL FORMING A CITY DO FOR THE RESIDENTS? A. Residents will have a stronger voice in planning, zoning, and land use. They will have a more credible intergovernmental position on such issues as toxic waste dumps, prisons, road construction, water supply, parks and recreation. If incorporated, the City of Santa Clarita could obtain equal partnership with other cities and governmental agencies. Q. WITHOUT BECOMING A CITY, HOW DO WE MAKE OUR OPINIONS KNOWN? A. Our population totals between 103,000 and 120,000 today, which is about 5% of the Fifth Supervisorial District. We have to hope our opinions are being made known to our Supervisor, or try to get an appointment to see him. If an appointment is obtained, it requires a round trip of between 80 and 100 miles to downtown Los Angeles to see him, and/or to attend various meetings and public hearings. There are about 8,000,000 people in Los Angeles County, each of us is a very small voice. At best, we have only an advisory relationship with our elected Supervisor. A. The biggest risk falls on the voters, because it would be our responsibility to elect five City Council members who are good, honest representatives. We would need to be interested enough to hold them accountable to us, and to maintain a well-run government. Q. WHAT ABOUT FIRE AND POLICE PROTECTION? A. Our city would be a 'general law' city and would contract for both law enforcement and fire protection with the L.A. County Sheriff and Fire Departments. More than 35 other cities in the County now have that arrangement. Q. ISN'T A CITY JUST ANOTHER LAYER OF GOVERNMENT? A. No. Municipal services will be continued through an administrative transfer to the City from the County. We would have the same services, but they would be administered by our own City Council … people we have elected. Q. HOW BIG IS THE PROPOSED CITY? A. The City of Santa Clarita would be about 90 square miles in size, which would make it the second largest in the County in area. We would be about eighth largest in population. Q. HOW MANY OTHER CITIES ARE IN LOS ANGELES COUNTY? Q. WILL WE ALL HAVE TO CHANGE OUR ADDRESSES AND ZIP CODES? A. No. Zip codes are assigned by the U.S. Postal Service. Our own community names will stay as long as we want them. Q. WHO WILL RUN THE CITY? A. A five-member City Council, elected 'at large.' This means that each voter would vote for all five council seats. Q. WHAT KIND OF SALARIES WILL THE CITY COUNCIL MEMBERS RECEIVE? A. State law sets ceilings on City Council salaries, based upon population. Under present law, the maximum each Council member could receive is $600 per month. The positions are considered to be part-time. A. The City Manager would be the most important staff person, and should be a professional in that field. We would also need clerical and planning staff. Q. WILL THE SCHOOL DISTRICTS CHANGE? A. No. School districts will stay as they are now, and voters within each District will continue to elect their own Boards of Trustees. Each district will continue to hire staff and select its Superintendent. The State of California is the primary source of funding for school districts, and that will stay the same. A. You may call 259-7485 or 252-4947 to talk to a member of the Cityhood Committee. If you need or want flyers, we will be happy to provide them. We can also supply speakers to talk to your club and/or organization. Documents from the files of Connie Worden-Roberts.